Since the 2017 General Election, the OBA have had a number of changes spanning various levels of their party — Leaders, MPs, Senate, Shadow Cabinet and Executive — and additional changes are expected, as they move towards what their leadership said is a “revitalized” OBA. 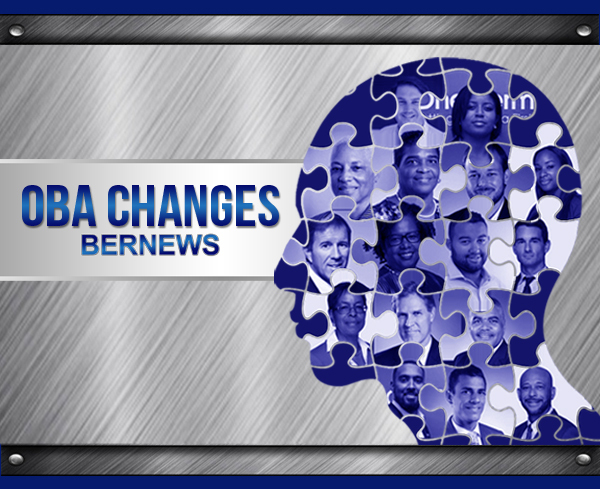 Michael Dunkley, Patricia Gordon Pamplin, Jeanne Atherden, Craig Cannonier, Leah Scott, Sylvan Richards, Lynne Woolridge, Nick Kempe, Justin Mathias, Andrew Simons, Robyn Swan, Jeff Baron, Dr Grant Gibbons, Scott Pearman, Nandi Outerbridge, and Tarik Smith are some of the people who have changed positions within the OBA in the 14 months since the General Election. 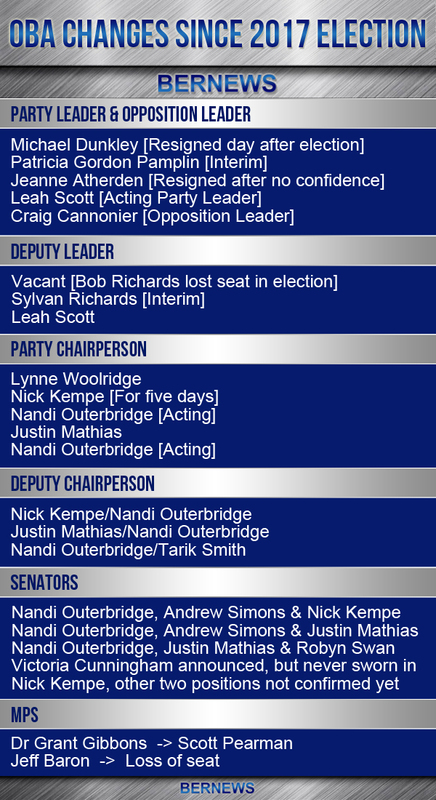 54.54% of the OBA MPs have served in the Party Leadership on a full or interim basis since 2017, with four as leader; Jeanne Atherden, Michael Dunkley, Craig Cannonier and Patricia Gordon-Pamplin; while Leah Scott and Sylvan Richards have served as Deputy Leader, with Leah Scott currently serving as Acting Party Leader. Michael Dunkley stepped down as Leader immediately after the election in July 2017, and former Deputy Leader Bob Richards lost his seat; resulting in a full change to the leadership. A few days after the election, Patricia Gordon Pamplin was named the interim leader, while Sylvan Richards was named the interim Deputy Leader. They were then replaced following an internal OBA election on November 18, 2017, with Jeanne Atherden elected as Party Leader, while Leah Scott was elected Deputy Leader by acclamation. Ms Atherden won 90 votes [37.3%] to defeat Patricia Gordon-Pamplin [82 votes - 34%] and Craig Cannonier [69 votes - 28.6%]. After the majority of OBA MPs expressed no confidence in her earlier this month, Ms Atherden resigned as leader, Leah Scott became the Acting Party Leader, and Craig Cannonier was sworn in as Opposition Leader, as while the two positions are generally regarded as the same, they are technically different, with Party Leader selected by the Party, while the Opposition Leader is officially appointed as the Governor. The party will be selecting the Party Leader, with nominations due by noon tomorrow, with Mr Cannonier expected to stand for the Party Leader position. Lynne Woolridge served as the Party Chairperson at the time of the 2017 July election, and following an internal party election in November 2017, Nick Kempe became the Chairperson, while Justin Mathias and Nandi Outerbridge were named Deputy Co-Chairs by acclamation. Less than one week later, Mr Kempe resigned as Chairperson and Nandi Outerbridge was appointed as the Acting Chairperson, serving for eight months. She continued to serve as Deputy Co-Chairperson, and in August 2018, Tarik Smith was also appointed as Deputy Co-Chairperson. In July 2018, Justin Mathias was appointed the OBA Chairperson and he resigned as Chairperson in September, having served for two months. Ms Outerbridge resumed the position as Acting Chairperson, and the party will be selecting a new Chairperson, with nominations due by noon tomorrow. Following the election in July, Nandi Outerbridge, Nick Kempe and Andrew Simons were appointed to the Senate, with Mr Simons and Mr Kempe later being replaced by Justin Mathias and Robyn Swan. In July 2018, the OBA announced that Victoria Cunningham would be appointed to the Senate, set to replace Justin Mathias, however it appears that Ms Cunningham was never actually sworn in. Mr Kempe is now set to return to the Senate, having been announced as the new Senate Leader this past Friday, and who holds/will be appointed to the remaining two Senate positions has not been confirmed as of yet. The OBA has also seen changes as far as their elected MPs, including a reduction of their seats in the 36-seat House of Assembly from 12 to 11. Both Jeff Baron and Dr Grant Gibbons resigned as MPs in April 2018, with Scott Pearman winning the seat previously held by Dr Gibbons in a by-election, while the OBA lost the seat previously held by Mr Baron. The changes have also resulted in changes to the Shadow Cabinet; as following the election Craig Cannonier served as Shadow Minister of Works and Infrastructure, Jeff Baron was Shadow Minister of National Security, and Dr Grant Gibbons served as Shadow Minister of Economic Development. All three of those no longer serve in those positions, and Michael Dunkley entered the Shadow Cabinet as Shadow Minister of National Security. The Party will be holding elections for the Leadership and Chairperson positions, with nominations due in at noon tomorrow. Craig Cannonier is expected to stand for Party Leader, having already been officially sworn in as Opposition Leader. There are also suggestions there may be more changes to the Senate team, with unofficial information suggesting that Mr Cannonier might appoint a whole new Senate team, with a former Senator and former MP unofficially said to be among those under consideration. While there has been speculation some elements within the Party may wish to see changes of MPs, that is not as easy as changing the Party Leader, Senators or Executive, which can be done via internal party procedures. MPs were elected in their constituencies, and if an MP were to resign that will prompt a by-election, as in the case of the two OBA MPs who resigned earlier this year. Changes to the Shadow Cabinet are also possible, as they are appointed by the Party Leader, so with a change of leadership, the Party may also make changes in that capacity.